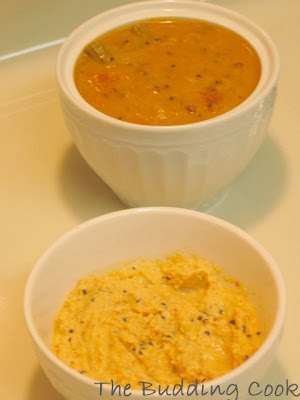 Mix the rice flour & urad dal flour in a large bowl making sure to break up any lumps. Add water to this to get the consistency of a batter. This should neither be too watery nor too thick. Mix well. In a small bowl, add a tsp of yeast & add 2-3 tsp of warm water to this to make a paste. Add this to the prepared dosa batter. Mix well. Allow it to stand in a warm spot for about an hour or so while the yeast goes about doing its business. (I usually leave this in my oven on the “warm” setting). After fermentation for an hour, the batter rises significantly. Mix well. Add the required amount of salt, mix again & now you are ready to go ahead and make your dosas! 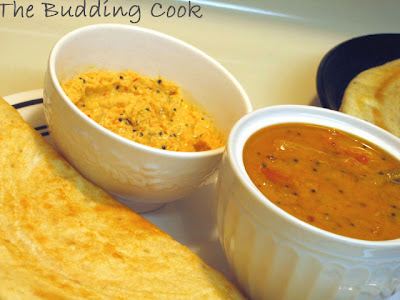 For step by step pictures and instructions on how to make dosas, please see this. *Use a cast-iron pan. It gives excellent results when compared to a regular non-stick pan. Grind all the ingredients for the chutney to a smooth paste using very little water. Heat the oil in a small pan & add all the ingredients for seasoning. Add this to the chutney. Mix well.Heat for a minute or so. This chutney is not cooked & hence does not last for more than a day or two. Sambar can be made in different ways using a variety of vegetables. This was how I made mine. Cook the dal until soft & mushy and keep aside. In a pan, heat the oil and add the ingredients for seasoning in the order listed above. Add the chopped onions, sauté for a bit. Add the tomatoes, cook for a minute or two and then add the drumsticks. Add the chilli, coriander, sambar & turmeric powders & mix well. Cover and cook for 2-3 minutes allowing all the flavors to blend in before adding the tamarind paste. Cook for another 2 minutes. To the vegetable mixture, add the cooked dal and blend well adding the desired amounts of water to get the right consistency. Cover and cook for 5 minutes. instant dosa sound good. can give a try. nice chutney! never tried with shallots. Now adding yeast is new and if I can make Urad dosa in few hrs,that is heaven sent.I will try next week.Thanks for all three. Hey your sambar looks so colorful and I can bet flavorful too. Wow, I am gonna make that sambar anytime soon. That't the only thing being a gujarati I haven't mastered. A hot favorite indeed! Looks great. sambar looks so appetising with that lovely color. is it homemade sambar pwd, if i may ask? That's a very easy way of preparing instant dosas!!!!! The tip is surely useful! very good recipe! I hope you are having a good weekend.Have you finished watching your DVD's ? Made a decision regarding the procedure you are gonna pick? Regarding grinding dry dal in the mixer... please don't do that.You have to soak it overnight first before grinding. If not overnight, at least 5-6 hrs. To answer your second question, yes there is a slightly sour taste to the batter due to the action of the yeast resulting in fermentation. Hope this has clarified a few things for you. Do try it & let me know. It is so easy to make! Nice to see you here! What are you waiting for. It doesn't get any easier than instant dosas! Welcome to my blog.Thanks for stopping by. Hi! You have a fabulous blog here! with all my favorite dishes :). Are you a mind reader ;). I heart Cauliflower au gratin and cream of broccoli.....and the dosa platter looks perfect! Instant dosa is very comforting. Doesnt look like it is instant. since batter hates to rise in this house of ours, this is the perfect recipe for us. thanks. Instant dosa using yeast is such a cool idea. Never ever thought of doin g that. Awesome snaps too. Musical, welcome to my blog! I am drooling, send me over some, girl. I had tried to leave a comment on your lotus root curry. After I typed it, the post disappeared. Padma, I have always made my this way & they always turn out great.Just be sure to use a cast iron pan, non-stick is not good for this! i am wondering what the difference would be in taste - i mean its almost the same right? It's nice to see you here.You are very generous with your compliments:-) Thank you for adding me to your blogroll. Regarding the details for making urad dal powder, I don't know how that is done! What I have used is the urad dal flour bought from the store(just as the rice flour was) All I did was mix the two together. Yes, you do need to add yeast as I have mentioned in my post. you mentioned that we should use tsp of yeast,did you use usa standard tsp(measuring spoons) or just a regular spoon,so that i can add exact quantity of yeast.is that okay if by mistake if i add more yeast than required?can i mix the dosa batter and yeast and ferment it overnight and make dosas next day instead of mixing yeast and keeping aside for an hour? Swetha- I used a regular spoon. I don't think it matters too much if you add another 1/2 tsp or so of the yeast. Just make sure you don't overdo it. I would certainly not leave the batter overnight after adding the yeast. An hour or so is really all it takes for the batter to double in volume.